This Grandma remembers some books from our children’s childhoods, some even by heart nearly fifty years later. Mostly, those are Dr. Seuss rhymes. March 2 was Dr. Seuss’ birthday which has been adopted as the annual date for National Read Across America Day, an initiative on reading created by the National Education Association. See post, Grandma loves Dr Seuss Books, Games, Puppets, Movies and More. March is also the month in which we received the treasure from Eric Carle, “The Very Hungry Caterpillar,” fifty years ago. 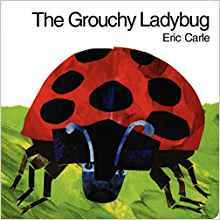 According to Wikipedia, the book “has been translated into more than 65 languages and sold more than 46 million copies, which is equivalent to 1.7 copies sold every minute since it was published.” Read more about Eric Carle at Wikipedia. Now we can share the creative gifts from Eric Carle with our grandchildren. “The Very Hungry Caterpillar” is one of seventy books by Eric Carle, who used bright primary colors in block printing, which so draws young children in. “The Very Hungry Caterpillar” teaches about a caterpillar turning into a butterfly, counting the foods he eats, and overeats, with cutouts, that were unique when the book was first published. Amazon says the book is for age 3 and up, but the board book is appropriate for babies and toddlers too. Buy at Amazon. There is a limited edition “The Very Hungry Caterpillar: 50th Anniversary Golden Edition Hardcover,” with Dolly Parton and bonus features. There is an edition with a stuffed animal toy that accompanies it. And that is just the beginning of what our grandchildren’s world has been enriched with happiness by Eric Carle. Another favorite is “From Head to Toe Board Book Board book” which teaches body parts and animals, and lots of movement. Buy at Amazon. There are so many Eric Carle classics to choose from, and a sprinkling makes a great visit present. Explore at Amazon. There are Very Hungry Caterpillar games and other toys and educational resources. See, for example, “The World of Eric Carle Let’s Feed The Very Hungry Caterpillar Game,”for ages 3 and up, with no reading required, available on Amazon. Expand to Eric Carle inspired puzzles, stuffed animals, stickers, and much more from infants and up to choose from on Amazon. There is now a Very Hungry Caterpillar Show, based upon Eric Carles’ books, with performances around the world. It has received several awards and great reviews. You can sign up on the website for emails when the show comes to your area. You will enjoy Eric Carle’s gifts to the world as much as your grandchildren. Happiness! After fifty years, Eric Carle is still giving us so much happiness from his talent and creativity.